‘We grew up in the same town, so I’ve known them since they were very little. They are incredible.’ We’re driving towards a gym in Groningen in my car and I just told Jason Isbell – who’s in the passenger seat – that I’m about to film a session with The Secret Sisters. It’s instantly clear how much he likes them. Well, he’s not alone. Listen, to the title track, The Damage, Carry Me, the funny He’s Fine or the album opener Tennessee River Runs Low they recorded in this session. The sisters – whom I first saw live opening for Ray LaMontagne in Utrecht back in 2011 – managed to write a dynamic collection. Inspired in some part by their self-proclaimed ‘terrible choices when it comes to choosing men’ (although now both married, happily) and the other troubles they’ve endured. If you haven’t read about the sisters’ start in music, you’re in for a treat. 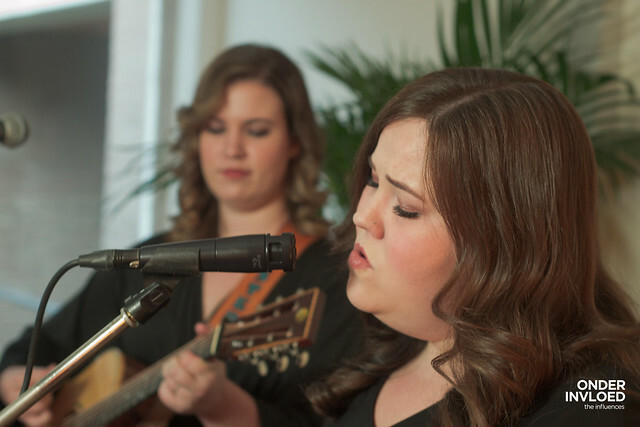 It’s a story seemingly coming straight out of a movie: two sisters who used to sing together in their house in Alabama, but not anywhere else, entered an open audition in Nashville. The end result: a record deal and opening tours for LaMontagne, Bob Dylan, Paul Simon and others. What could go wrong, right? Well, it is a classic tale I’m afraid. Not long after the release of their second record Put The Needle Down the label dropped the two and they were left with a lawsuit, money issues and disappointment. A mess, basically. Although they worked different jobs and tried to stay active in music as much as possible, it was doubtful if the two would ever record, let alone release music again. Thank god for Brandi Carlile. Late 2015, the sisters were opening a couple of shows for their friend Brandi Carlile – who they met when touring with Ray LaMontagne years before. They had been working on a few songs, although not very seriously, Lydia admits. ‘We played one of them at sound check and Brandi happened to be listening. She was impressed and asked us to play her a couple more backstage. “We have to make something happen and find a way to get this out into the world”, she said.’ About two months later, Laura and Lydia flew out to Seattle to record at Bear Creek, a studio in the woods outside the city. Seeing The Secret Sisters play and record again is what made me feel good. So, with that incredible yet slightly cheesy bridge, let me leave you to watch them cover Paul Simon’s Kathy’s Song, The Everly Brothers’ Lonely Island and play their own ‘Tennessee River Runs Low below. TakeRoot is a wonderful festival for (American) roots music in Groningen. This year’s edition marked the 20th anniversary for the festival in the North of The Netherlands. The Influences filmed four sessions at the festival. This is the first. Audio mixed at Mailmen Studio by Alwin van der Knijff.